Aloha. E komo mai. Welcome to this site and to my studio. Mahalo/Thank you for your interest in Lomi Lomi, Lomilomi, Hawaiian Lomilomi Massage or Hawaiian Lomi Lomi massage. The word lomi can mean massage, "or to press, to rub and to break up into small little pieces with the fingertips." I am a kanaka lomi in Hawaiian or massage therapist or masseuse in Maine. What lomi lomi is, is a unique healing massage derived from the ancient Polynesians and more specifically the master healers, the kahuna or healing experts of Hawaii. Along with the ministers of prayer, the professionals who could just look at the person and see what was their best method of healing, and the wise ones knowledgeable about the healing powers of herbs and flowers; there were the kahuna lomi who served as the professional experts who knew the ways of doctoring the body with touch. To understand the depth of lomi lomi massage, it helps to have an understanding of the Hawaiian priestly philosophy called Huna, and how the philosophies of Huna relate to bodywork and healing. A fundamental assumption of Huna is that everything seeks harmony and love. So how does this relate to massage? Perhaps this can best be understood by one of the alternate names for lomi lomi, and that is "Loving Hands" massage. The reason for this is that it works gently yet deeply into the muscles with rhythmic, flowing strokes, totally nurturing the body and, enabling the recipient to relax, give in and simply be. What is different about a lomi lomi massage? The basic lomi lomi massage pressure, rhythm and strokes are very effective in discovering where the body needs more assistance. The special movements of the fingers, thumb pads, palm heels, ulnar surface of forearms and even controlled elbow pressure, break up the muscle spasms. But, while technique is an important part of the massage and associated healing, much of the work is done by love, with the focus of the practitioner on the client being deep and complete, using loving hands and a loving heart. This flowing with total energy, using the long continuous, flowing strokes, deepening compressions, combined with the very loving touch, relaxes the entire being, assisting in a letting go of old beliefs, patterns and behaviors that cause limitations and which are stored in the cells of our body. People generally think of memory, beliefs, our "programming", as being stored in our head, in our brain. This is not the case, this memory and other programming is in fact stored in all the cells of our body. The Hawaiians look at things in terms of energy flow, following the idea that an idea or belief can block energy flow as much as muscle tension can. Lomi lomi helps release the blockages, while at the same time giving the energy new direction. Thus lomi lomi is not just a physical experience; it also facilitates healing on the mental, emotional and spiritual levels as well. The Hawaiians view all aspects of the body as one and believe that the physical, mental, emotional and spiritual are all part of the "whole" self. When healing is effected on one level, all levels respond. When harmony is lacking, the effect is physical, mental, emotional or spiritual pain or disease. Illness is a state of tension, which leads to resistance which blocks energy movement. Lomi lomi helps release this and therefore facilitates the road to healing. On the physical level, through lomi lomi stress and tension are relieved, blood and lymph flow assisted and the elimination of wastes and toxins stimulated. Aunty Margaret lovingly healed with prayer, herbs, lomi lomi, steam baths and salt water cleanses. So, what happens during a lomi lomi massage? How is it performed? How often should one get a massage? After checking in with the client about their reason for coming for a session, and with both client and practitioner being mindful of this, a lomi lomi usually commences with a stillness between the practitioner and client, often with the practitioner's hands gently resting on the clients back. In this stillness the practitioner will quietly say a blessing or prayer asking for whatever healing is needed to take place during the massage. During the session the massage is often given in fluid, rhythmic motion using the forearms as well as the hand parts in changing pressure. Some people have described this as feeling like gentle waves moving over the body. By working on areas in patterns of rhythm and pressure, a deep sense of balance and harmony is achieved. Advanced work can follow in other sessions as needed. Aunty Margaret always emphasized that we should "never give up". To be effective we need to be committed. That did not mean all in one session. Sometimes one session would assist in finding rebalance, sometimes a few, and occasionally the full treatment would take many sessions, to the point that the client would move in with the Kahuna lomi lomi for a few days. Lomi lomi sessions every 2 to 3 weeks are a nice benefit for the body and mind of many, in our busy, stressed lifestyle. The advanced lomi lomi treatments are usually one hour, three or more times a week, then less frequently as the client recovers. Treatments are tailored to the client's needs. Lomi lomi has been used to work with whiplash, stroke, sports injuries, pulled muscles, edema, severe emotional stress, stressed wrists or ankles, stiff necks and shoulders and back pain among other soft tissue troubles and challenges. As I said earlier, while technique is important, the priority is loving the body, using intuition so the massage is right for the client at that moment. The client on the table is viewed as someone to be returned to harmony and balance. It is important to remember that the practitioner does not heal but is the facilitator for the healing. Some warm stone assisted, under body and full body strokes also help to free the energy, make the body soft, promoting free and abundant flow of life energy in the recipient. According to Huna philosophy, energy also gets blocked in the joints. Gentle stretches of the body and gentle rotations of the joints are therefore also incorporated to assist the release of tensions and assist the flow of energy, once again not forcing, but feeling the level of the clients resistance or comfort. The massage therapist may play music or hum at various points during the lomi lomi as the vibrating and amplified energy that results also aids the release of blockages. This combined with breathing techniques by the massage therapist are also important in assisting the energy flow. The sharing of the breath, the essence of the Creator or universal energy, whatever name you like to give it, is an old Hawaiian custom and greatly enhances the energy flow once again. Lomi lomi in Maine, as called for my our laws and in a cooler climate, occurs with draping on a massage table, maintaining the recipients modesty. Because the practitioner often works intuitively, based on much training and experience, a massage may be slow and very relaxing or at times it may be a little faster and therefore more invigorating and enlivening to the body. Sometimes the recipient may experience an emotional release. The massage can release and shift negative emotions, negative beliefs and other "stuff" that has been stored in the cells of the body. The healing effects of the massage are known to continue after the massage is over. Auntie Charlo~Passing on the loving touch. This began with, "Aloha!" The Aloha Spirit refers to the attitude of friendly acceptance for which the people of Hawaii are so famous. Aloha stands for so much more than hello or goodbye or love. Its deeper meaning is “the joyful sharing of life energy in the present". Like the Sanskrit word, Namaste, it can say, "My spirit greets your spirit." This really is one of the strengths of Aunty's lomi lomi; she often said to "love and nurture the body (of the client) as if it was your own". 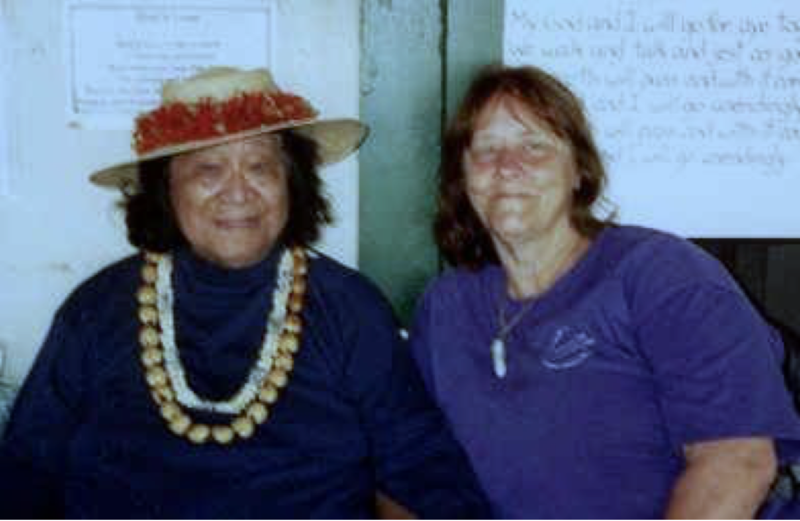 Aunty Margaret, my teacher, who was one of the oldest and widely recognized teachers of lomi lomi, had a definition of lomi lomi which is, "The Loving Touch - a connection of heart, hands and soul with the Source of All Life!" Her local and worldwide students of lomi lomi learned to flow the love from the heart, through the hands, to connect with the soul of the one receiving the massage. Healing is increased by love, love received and love given. A dictionary definition of love is fondness, a deep or passionate affection to someone or something. To the Hawaiians it is so much more. It also includes ho'oponopono a releasing of the many forms of negativity to tolerance, forgiveness, acceptance, non-judgment, appreciation, compassion, respect and so many other elements. This ho'oponopono and aloha is the very foundation of a lomi lomi massage and my massage practice. This photo was taken on one of my return visits to Aunty Margaret Machado, down at the Keei Beach house with the steam house out behind. On its lanai she held her "Hawaiian Massage School." Lifelong friendships developed in that loving and tropical atmosphere. I can still feel her hand in mine when the photo was taken. As I massage, her subtle way echoes in my mind, whispers, "lovingly guide, don't give up, lomi lomi is praying work, always forgive and let go, wiggly wiggly, do you massage the belly?, let them see you wash your hands, warm the oil in your hands, work with the breath, drop-two-three, use your body." Aloha nui loa. M&amacr;lama pono!/Take care!